A group of Denver Republicans won a Colorado Dragon Boat Festival race over the weekend, but they say they won't return next year because organizers told them to remove a "Trump 2020" flag. 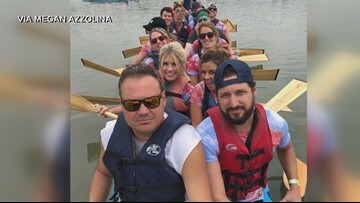 DENVER — A group of Denver Republicans won a Colorado Dragon Boat Festival race over the weekend, but they say they won’t return next year because organizers told them to remove a “Trump 2020” flag. “Other groups had paraphernalia hanging around for what they believed in. I just don’t think we should have been targeted and had to take our banner down just because somebody didn’t agree with our views,” Azzolina told Next with Kyle Clark. Organizers, however, said the Water Elephants chose not to follow the code of conduct. Flags like the one the Water Elephants displayed are not allowed in the pre-race area, where teams organize before a competition. Teams sign pledges to keep political and religious messages out of this zone, according to Tesia Chen, who works with the festival. Chen offered to provide 9NEWS with a copy of the policy and then deferred to a colleague, who could not be reached. Chen also added that the Republican group violated festival rules by staking their tent to the ground and drinking alcohol in the pre-race area. Chen said that a Democratic group at the festival to register voters was within the rules because it stayed in a separate area where such activity was allowed. The Water Elephants won the novice race this year, according to Azzolina. Chen says the team is welcome back in 2019, but Azzolina said they won’t be competing again.